What you need to know about investing in the Nasdaq 100. More investors than ever are interested in stock market indexes, largely due to the popularity of exchange-traded funds and the various benchmarks they track. Yet while many people know about the Dow Jones Industrial Average and the broad-based S&P 500, other market indexes don't get as much exposure. The Nasdaq 100 is one of those indexes, and though many people think of it as a niche benchmark for technology stocks, it's actually composed of a much more inclusive set of companies. Let's take a closer look at the Nasdaq 100 and how it can help you in your investing. What is the Nasdaq 100? The Nasdaq 100 is an index that includes 100 of the largest companies listed on the Nasdaq Stock Market. Unlike most other major benchmarks, the Nasdaq 100 specifically excludes companies from the financial industry, but the other sectors of the market are well represented in the index. Over the years, though, the Nasdaq 100 has gained a reputation for being a technology index. That's largely because for a long period of time, the young technology companies that eventually became the titans of the industry nearly universally chose to list on the Nasdaq rather than the New York Stock Exchange. By contrast, the NYSE has done a good job of attracting the largest companies in most other sectors, thereby leaving the Nasdaq 100 overweighted in tech stocks. Technology makes up well over half of the total value of the Nasdaq 100, but consumer and health care stocks also have respectable weightings in the index. What is the history of the Nasdaq 100? Because of its connection to the technology industry, the history of the Nasdaq 100 has largely mirrored that of tech stocks. The tech boom of the late 1990s vaulted the Nasdaq 100 to much stronger returns than the broader market, and the subsequent plunge in tech stock prices hurt the index far worse than the Dow or the S&P 500. Nasdaq 100 data by YCharts. The Nasdaq 100 was established in early 1985 as part of the Nasdaq Stock Market's efforts to become more competitive against the NYSE. Unlike the Dow and S&P 500, which reached several new record highs in 2006-2007 and 2013-2014, the Nasdaq 100 has had to work much harder to even approach the heights it hit in early 2000. How many companies are in the Nasdaq 100? Given the index's name, this might seem like a silly question. The Nasdaq 100 does in fact usually include 100 stocks. But there's a twist that makes the answer a bit more complicated. Ordinarily, the Nasdaq is diligent in keeping the Nasdaq 100 up to date. When companies go through mergers or reorganizations or decide to list on a different exchange, the Nasdaq 100 index is quickly updated to restore its component count to 100. In some cases, though, the Nasdaq 100 will actually have more than 100 stocks. For instance, when Google split its shares into two different classes, both classes of Google stock were included separately within the Nasdaq 100, giving it 101 components. In the Nasdaq 100's subsequent quarterly rebalancing, however, the index kept only Google's Class C shares, adjusting its weighting accordingly. 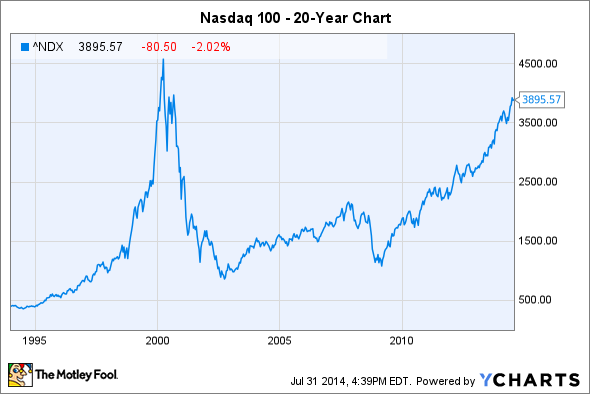 Why invest in the Nasdaq 100? The top components in the Nasdaq 100 are a "who's who" of leading global companies, with particular emphasis on technology and biotechnology stocks among the 15 largest components. The Nasdaq 100 is a truly global index: For years, it hasn't considered the country in which a company is based as part of its criteria for inclusion. Traditionally, technology and biotech have been among the highest-growth areas of the market, and that has made the Nasdaq 100 suitable for aggressively minded investors with tolerance for above-average risk. More recently, though, some of the top stocks in the Nasdaq 100 have appeared almost value-priced, encouraging stronger consideration from more conservative investors as well. It's important to understand, though, that investing in only the Nasdaq 100 leaves a huge gap in your stock market exposure. Many of the best-known companies in the market list their shares on the NYSE, and a Nasdaq-only portfolio will leave those stocks out of your portfolio. So, while the Nasdaq 100 is fairly broad, it isn't as balanced as some of its counterparts, and it therefore serves best as a single piece of your overall investment strategy, rather than as your sole investment in the stock market. That said, the Nasdaq 100 is a great place for investors to look for promising investments, either as an index to track through a suitable exchange-traded fund or as a starting point for doing research on individual stock ideas. With many investors seeing huge long-term opportunities in the technology industry, following the Nasdaq 100's movements will keep you informed about what's happening in tech and what impact the industry is having on the stock market more broadly.